This quilt has been on the go for too long. I made six of the nine stripey stones I need, then it stalled for lack of suitable fabric, but must be finished before I start another quilt... I have a bucket list of quilts which is probably now long enough to last a life time but luckily I will have got bored of some of the ideas before I ever start to make them! How my work differs from others in its genre - I'm not sure it does! My quilts are not even very like each other. It is very early days in my experiment with quilting and at the moment I am happy hopping from one idea to another and seeing what happens. How my creative process works - I rarely sketch things out but add the name of a quilt to my bucket list and keep all the details in my head. I spend a very long time thinking about a project, before finally getting started. Then I spend a very long time making it mostly because I tend to keep thinking of different options at each stage and getting paralysed by indecision. I often make a false start because I like stubbornly working things out for myself. Work and life get in the way too. Either way I try not to feel bad about the lack of productivity! Very rarely, I have one clear vision right from the start and work like a mad thing until it is done - it is lovely when this happens. One of the "rules" of the Round the World Blog Hop is that you should recommend a handful of blogs and invite those bloggers to take part. I always feel a bit uncomfortable about it in case it's not someone's cup of tea so I'm just going to point you towards a handful of blogs that I really like which you might not already have discovered, leaving it up to those bloggers whether they would like to take up the torch (or cup of tea) and run with it! wonderful quilts in every size and amazing photographies!!! Sure that stripy stones quilt will be beautiful when it is finished too! What a fab selection of photos you chose for this! Lovely, as always. So nice to read about your ideas and process - your blog is so calm and refreshing. The stone quilt is such a neat idea! Always enjoy your beautiful blog and quilts... and your photos are very cool. 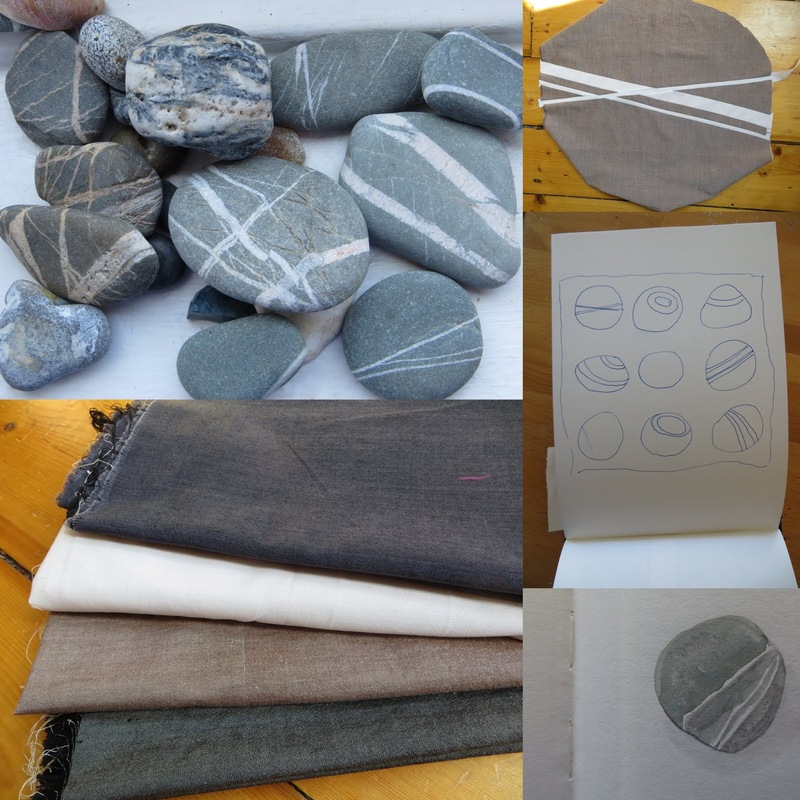 Beautiful work, I look forward to seeing the striped stones quilt come to fruition. Indecision and false starts also form a large part of my 'creative process' (which is probably why I don't seem to get much done!). Thanks for the mention too! Stone Quilt sketch is photo is fab. Grey and white is my favorite color combination. Can't wait to see it finished. Personally, I make one quilt at a time because I have a teeny tiny house, but also because I am a deeply sequential person. My life has gone so much better sinceI realized that! I love reading about your process and the stone quilt is fabulous. I can relate to trying not to feel bad for slow productivity, too. Also, thank you for the shout out. I'm flattered to be in such good company - I'm blushing. Beautiful work and photography and your stone quilt idea is amazing, really looking forward to seeing that one finished too. It's been lovely getting to know more about you and seeing some of your gorgeous work. So many wonderful quilts and the stones quilt is going to be stunning. Looking forward to meeting you very soon at the Stitch Gathering!! Thanks so much for recommending me in that lovely considerate way Catherine! I'd love to take part and the gentle prod might be just the thing I need! I'm struck reading this by how many beautiful quilts you make in solids, both muted and bright-gorgeous!